A judge Wednesday kept bail at $2 million for a Navy man who was allegedly drunk when his truck flew off a transition ramp to the San Diego-Coronado Bay Bridge and crashed into a crowd 60 feet below in Chicano Park, killing four people. Defense attorney Paul Pfingst said his client, 24-year-old Richard Sepolio, was not under the influence and was trying to pass a car whose driver was attempting to cut him off when he was forced over a concrete wall shortly after 3:30 p.m. on Oct. 15. Pfingst unsuccessfully argued that Sepolio, a Navy aviation electronics technician assigned to a Coronado-based helicopter squadron, should be released to the Navy and confined to base so that he can have surgery on fractured vertebrae in his neck, a broken hand and broken ribs. The attorney said Sepolio would return to court to face trial once the needed surgeries are done. “He’s not a flight risk, he’s not a danger to the community,” Pfingst of his client. Pfingst said Sepolio used the Uber ride-hailing service prior to drinking and after drinking until he was aware his blood-alcohol level had dropped and it was safe for him to drive back to base. The attorney said authorities used a breathalyzer device about an hour after the crash to measure Sepolio’s blood-alcohol level and it came out to a .05 and .06 percent. An hour after that, Sepolio’s blood was drawn and it was measured at .08 percent, Pfingst said. Deputy District Attorney Nicole Rooney told Judge Frederick Maguire that Sepolio drank wine and a couple of cocktails with a friend before deciding to drive home, despite warnings from the friend. Sepolio’s blood-alcohol level was estimated to be between .08 and .09 percent at the time of driving, according to prosecutors. 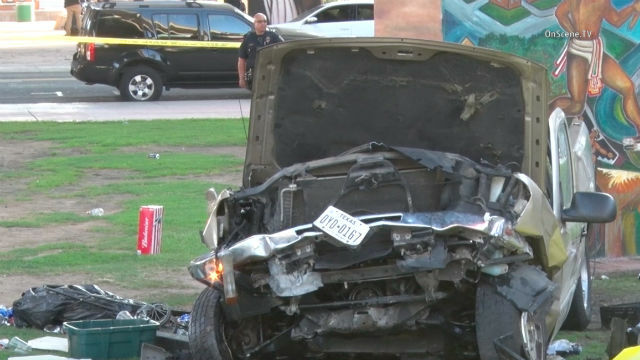 The crash killed Annamarie Contreras, 50, and Cruz Contreras, 52, a married couple from Chandler, Arizona, and Hacienda Heights residents Andre Banks, 49, and Francine Jimenez, 45. Eight other people were injured. Jacob Contreras, the nephew of Cruz Contreras, urged the judge to keep Sepolio’s bail at $2 million, alleging the defendant was speeding, under the influence of alcohol and distracted because he was using a cell phone while driving. According to Sepolio, another driver wouldn’t let him move over, so he gunned his engine and was going 81 mph in a 45 mph zone when he hit the left guardrail and spun off the freeway and landed in Chicano Park, prosecutors said. Sepolio, charged with gross vehicular manslaughter while intoxicated and DUI, will be back in court Jan. 25 for a preliminary hearing. He faces nearly 24 years in prison if convicted.